You ever roll with the guy who says let’s go light, and then proceeds to grab you and drive you over 3 sets of other people rolling? They then smash you into the wall, grab a heel hook and crank it wildly as hard as they can. Before you can tap, you’re knee pops 5 times. “Thanks knee for tapping for me, I was just about to do that, but this gorilla didn’t give me a chance.” I used to have of trouble with guys like this. Ultimately, it’s the instructors/owners burden to keep everybody safe. Reckless training would lead to unhappy or to injured students. That would lead to bad attendance due to injury. Which would lead to less training partners coming to the gym, which would lead to uninspiring classes. That would lead to guys not progressing as quickly in their training. Not to mention it would lead to less money coming in. No money, we can’t pay for lights, water or a space to even train in. After years of not knowing what to do, I decided to change it up. Now, everyday before rolling, I do a quick injury check. I ask who has any injuries, which helps people remember that some people can’t go super hard, and lets the class know the instructors are paying attention, and we’re care about safety. After that, I give a speech to the class about our number 1 priority, taking care of your training partners! This is your number one job as a member of the team. If you let them get hurt, you got nobody to help you out. If you injure people, it will spread quickly and soon people will avoid training with you. -100%, it’s only if you’re fighting for your life against Nazi war criminals, evangelical leftist rapists or an equally threatening foe. -80% is for fighting for the UFC championship belt. -70% competing at a friendly Jiu Jitsu tournament. -60% solid training for a competition or fight. This is reserved for people who understand the risks of training hard and accept the risks, I keep this separate usually. -50% good old competitive everyday training. This is for 90% of the people. Under most circumstances, training at this rate, you should be able to get up and go to work the next day, and train again tomorrow. It’s competitive, it’s challenging, yet it’s good natured, and enjoyable. It works extremely well at our gym. Injuries happen much less frequently at 10th Planet Jiu Jitsu now days. It’s not the good old days of MMA/BJJ, we’re much smarter now. Therefore we have to be more responsible with our health. 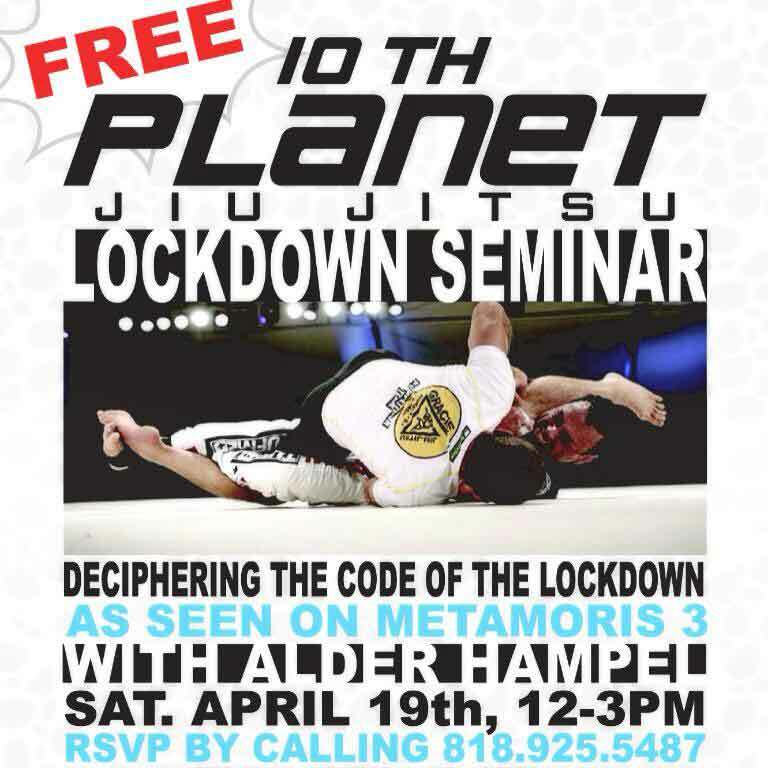 10th Planet Van Nuys Presents a free lockdown seminar April 19th, 2014. 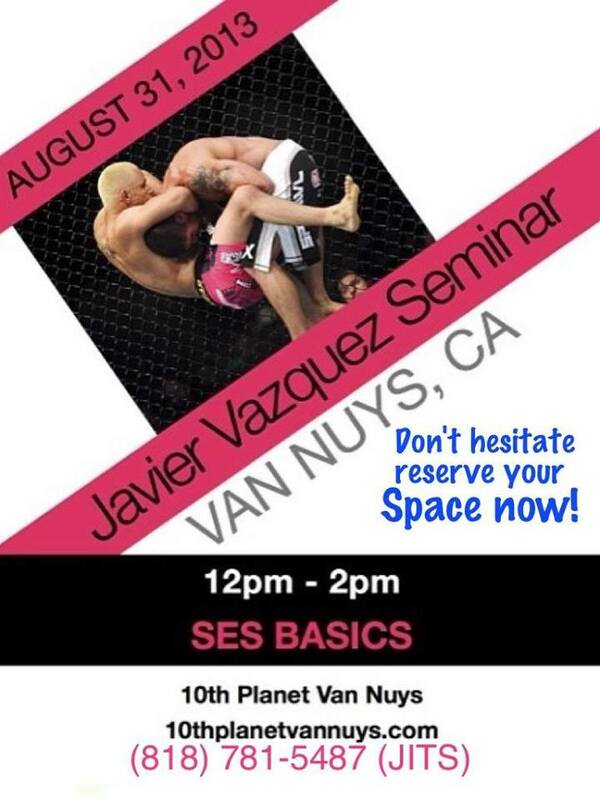 Friendly reminder, the Lockdown seminar is this weekend. Please R.S.V.P. to ensure you spot. This event will fill up, and we cannot admit anybody more when it hits capacity. 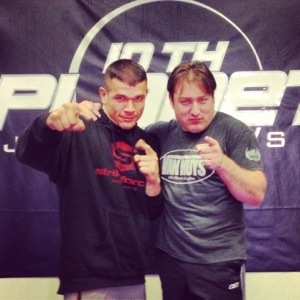 10th Planet Van Nuys, Milton Arguello’s post fight interview with Dawna at the U of MMA. Fresh of his triangle submission win, he looked amazing. Look for much more of this kid in the future! 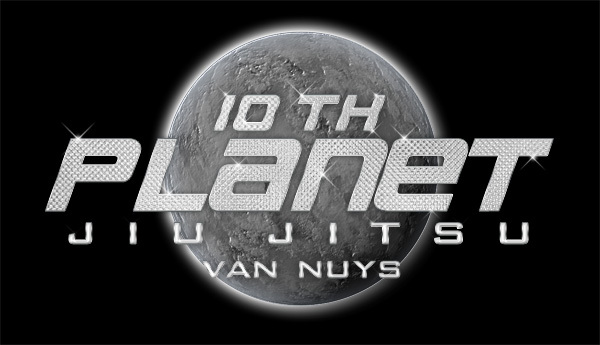 10th Planet Jiu Jitsu Van Nuys Gets a New Crash Pad! We just got ourselves a new Dollamur Swain landing pad! These things are wonderful for practicing high impact slams, throws or flying attacks on. No more knocking the wind out of ourselves when trying out that flying triangle or armbar! Students can be tentative trying out these moves sometimes because of the the fear of landing hard, and possibly injuring themselves. Not anymore! These things feel like your landing on a nice cushy cloud. Not only are they good big huge double leg slams, but we can now practice our pro-wrestling moves on each other as well. Look for more fun things to come from this essential piece of training equipment! 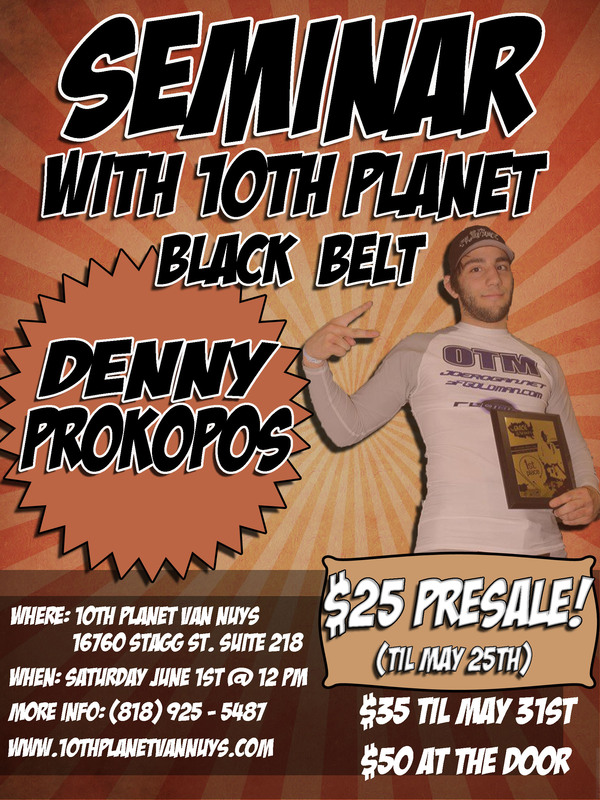 10th Planet’s First Black Belt, Denny Prokopos is Teaching a Seminar June 1st in Van Nuys! Denny Prokopos was born in San Francisco around 1988. He was interested in Pro Wrestling as a child, and it was looking for Pro Wrestling tapes at a video store that he found out about the UFC. He bought a few tapes of the fighting organization’s first tournaments at the store and as he saw the footage he was amazed by Royce Gracie’s prowess inside the cage. He was so fascinated by the Gracie Jiu Jitsu style that he managed to convince his parents to let him train Jiu Jitsu (who vehemently opposed to it in the beginning). He was 12 years old when he started and his first coach was Charles Gracie. 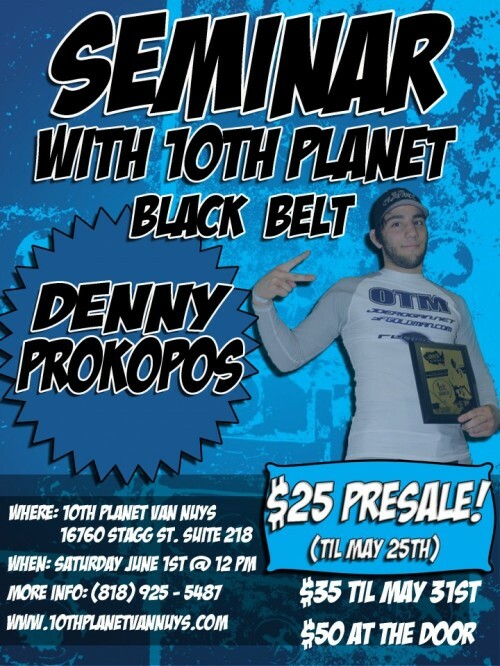 As Denny got more involved with Jiu Jitsu, he started preferring the Nogi aspect of the game; this was when he sought out Eddie Bravo for private classes in Nogi. Eddie at the time had already made a name for himself in the Nogi community and was a great believer of the benefits of training without the kimono. Denny ended up leaving his previous instructor and turning his full attention to Eddie Bravo’s way of thought and method, he was around 16 at the time. In highschool Denny Prokopos also added wrestling to his resume, competing all throughout secondary School with the exception of the last year due to a bad injury that prevented him from training. He ended up quitting the academic life to focus solely on Jiu Jitsu training and competition, that hard work and dedication paid off with several important victories at a national and international stage, culminating with his black belt award in 2009. In that same year he was part of the American National Team at the FILA Grappling Championship, being coached by Ricardo Liborio in preparation for the tournament (a competition he won), he has also worked extensively with Jake Shields. 10th Planet Van Nuys was fortunate enough to be hired by Warner Brothers to help out with EA’s new UFC video game. They were responsible for recording all kinds of sounds that will be used in the game. Coach Alder Hampel was a consultant on the project and helped direct his students, Georgie Garcia, Mile “Lobes” Frausto, Mike “Tipz” Venturella, Ryan Bradford, Yumi Matsumoto, David Alvarez, Sven Manseau, Gabe Calvento and pro mma fighter, Keenan Lewis. The guys did an amazing job and the EA rep Ted Conely was stoked with their work. Make sure everybody goes and and buys this game when it comes out! You can imagine us when you hear the in game sound fx! 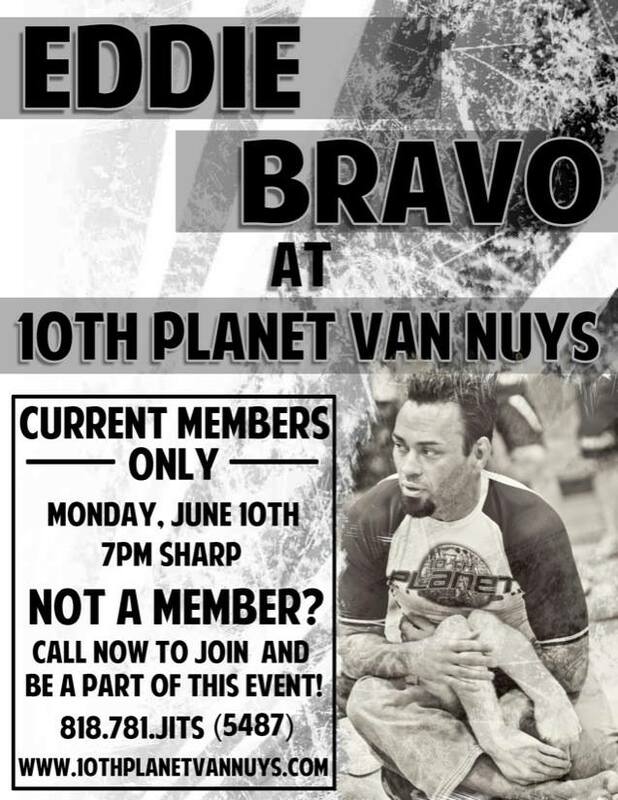 Mike “Lobes” Frausto (10th Planet Van Nuys) Fights Saturday April 6th! 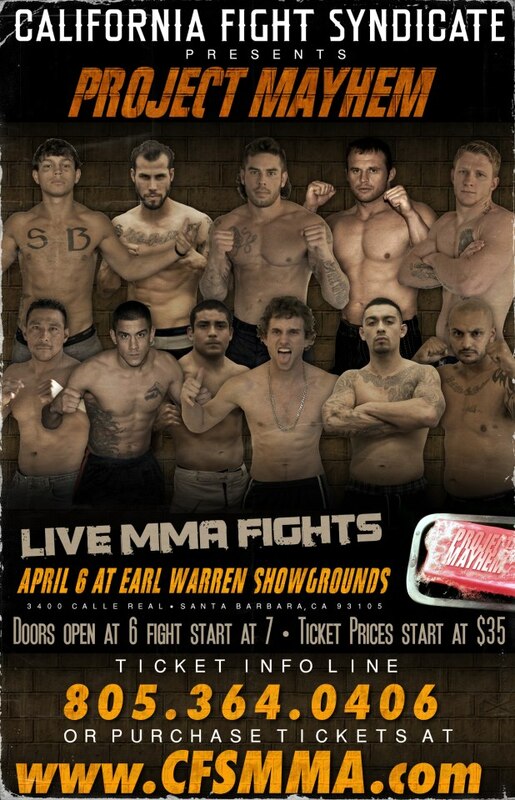 Mike “Lobes” Frausto fights for the California Fight Syndicate this Saturday, April 6th. He will be fighting Santa Barbara’s badboy, Bren O’Neil for the CFS 155lb title. Lobes is coming off 2 very impressive first round finishes, one armbar and one tko. This fight is sure to be fireworks! Ticket prices start at $35, so get yours today!